The Philidor Trio, consisting of Elizabeth Humes, soprano, Edward Smith, harpsichord, and Shelley Gruskin, baroque flute and recorders, perform a program of Baroque music and arias at WBAI's Free Music Store on January 14, 1972. The second part of this program includes performances of La Forqueray, Chaconne, and Medée by Jacques Duphly; a cantata from Phyllis und Thirsis and Four sonatas for flute and harpsichord by Carl Philipp Emanuel Bach; a number of Italian arias, Le donne col cervello by Baldassare Galuppi, Immagini dolenti by Giuseppe Scarlatti, Se tu m'ami by Giovanni Battista Pergolesi and Se gli uomini sospirano by Galuppi; and The stocking by Thomas Stokes. 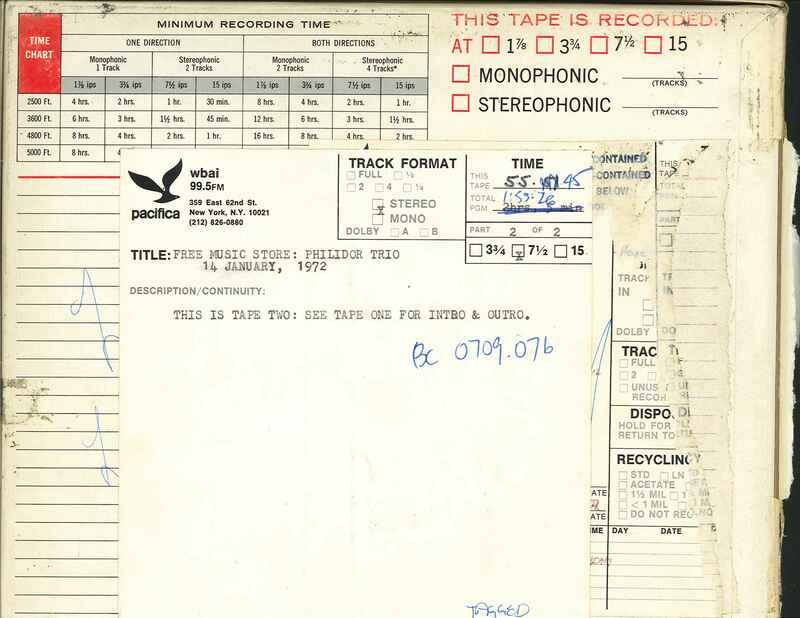 This recording was formerly cataloged as BC0709.07B. Audio distortion around 00:23:55. 2 reels (114 min.) : 7 1/2 ips, mono.